What happens when you are followed by millions . . . and loved by none? Twenty-seven-year-old Logan Wade is trying to build a life for herself far from her unhappy childhood in Oklahoma. Until she gets the call that her famous cousin needs a new assistant— an offer she can’t refuse. Logan hasn’t seen Kelsey in person since their parents separated them as kids; in the meantime, Kelsey Wade has grown into Fortune Magazine’s most powerful celebrity. But their reunion is quickly overshadowed by the toxic dynamic between Kelsey and her parents as Logan discovers that, beneath the glossy façade, the wounds that caused them to be wrenched apart so many years ago have insidiously warped into a show-stopping family business. As Kelsey tries desperately to break away and grasp at a “real” life, beyond the influence of her parents and managers, she makes one catastrophic misstep after another, and Logan must question if their childhood has left them both too broken to succeed. Logan risks everything to hold on, but when Kelsey unravels in the most horribly public way, Logan finds that she will ultimately have to choose between rescuing the girl she has always protected . . . and saving herself. Emma McLaughlin and Nicola Kraus met at New York University’s Gallatin School of Indi-vidualized Study, where they both graduated with concentrations in Arts in Education. Before teaming up to write The Nanny Diaries, Kraus had continued in the arts and McLaughlin worked as a business consultant within the private and public sectors. Newsweek declared McLaughlin and Kraus’s The Nanny Diaries a ‘phenomenon.’ It is a number one New York Times best-seller and the longest-running hardcover best seller of 2002. In 2007 The Nanny Diaries was released as a major motion picture starring Scarlett Johansson, Laura Linney and Alicia Keys. They have contributed to The London Times and The New York Times as well as two short story collections to benefit The War Child Fund: Big Night Out and Girls’ Night Out. In addition to writing for television and film, they travel around the country speaking to young women about gender issues in American corporate culture. Between You and Me was not what I expected going in. I went through a huge chick-lit phase right around Bridget Jones Diary time and still have several shelves of my library dedicated to books targeted toward women and marketed as fun, madcap and easy reads. McLaughlin and Kraus' The Nanny Diaries sits firmly on one of those shelves. So, my mistake upon starting Between You and Me was that I thought I was getting into a lighthearted, breezy read with obvious villains and harried yet heroic protagonists. Between You and Me is dark, sad and sometimes depressing. This is not a bad thing, just not what I was expecting. The majority of the characters are completely terrible and only out for themselves. I don't need to read books that only consist of characters whose morals I share. (I would hate the majority of the characters in The Great Gatsby if I were to meet them IRL, but I love that novel.) It is okay to not identify with fictional characters and still enjoy the tale. Sometimes, I think it is important for us to read books like this. So, the scoop is, Logan's cousin, Kelsey, is a mega-pop-star (much like Brittany Spears). After a years-long separation, Kelsey asks Logan to come on board as her personal assistant. Thusly, our heroine, Logan is thrust into the seedy, yet glamorous, world of super-stardom. Kelsey, once a child star, just can't get a break, not from her hectic schedule, or her overbearing parents, the paparazzi, her manager, or ultimately, from herself. Between You and Me is a study in the downward spiral of a girl that can't stop moving. Through the Logan's eyes we see circumstances turn ugly for Kelsey time and time again. Logan is the protagonist of Between You and Me, but this story is all Kelsey's. The two also share a childhood secret, revealed at the end, that makes you feel like they both really never had a chance in the world to have normal relationships with each other or anyone else. 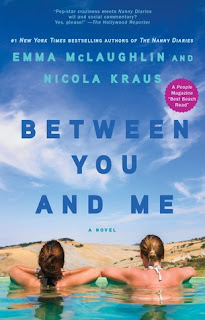 Between You and Me does have a nice epilogue that ties the story up on a happier note, but the overbearing feeling I got from this story is sadness. This book was a page-turning read, if not what I expected and one that will stick with me for some time.